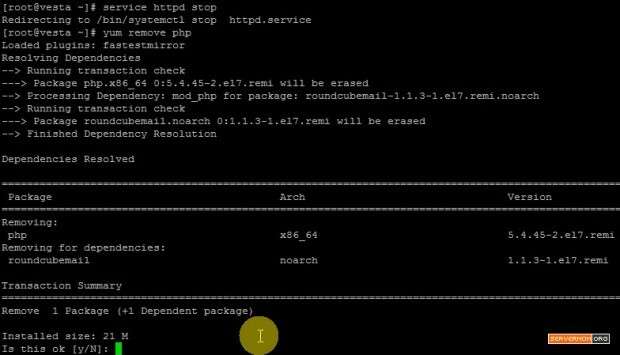 How to install PHP 7 (stable) on VestaCP server running on CentOS 7 with some test results of how VestaCP + PHP 7 can perform together serving WordPress site. 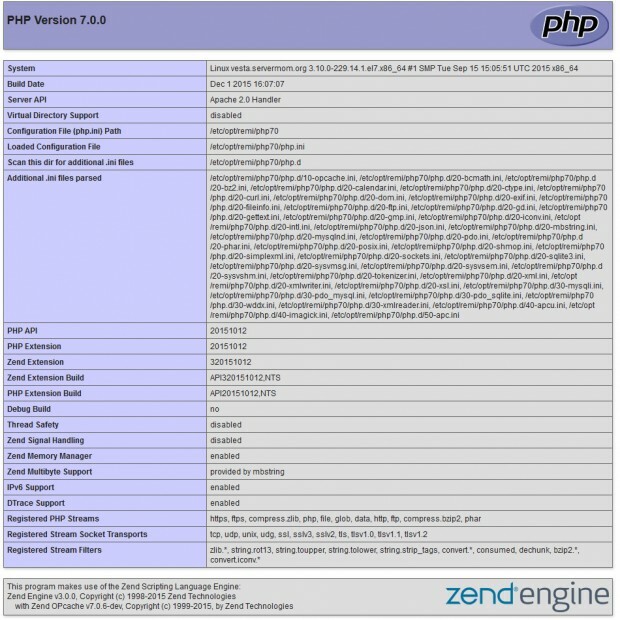 For your information, PHP 7 has just been released and many rumors say it can perform multiple times faster than previous stable PHP version and also as fast as HHVM. This is the most anticipated PHP version ever bringing many new features, enhancements, and improved performance. Until the time I write this post, VestaCP is by default using PHP 5.4.x installed and running with web server (either Apache or Nginx). I’m not really sure why its developer still pack PHP 5.4 within VestaCP installation but as far as I know PHP 5.4 is the most popular stable version after 5.3 that many scripts, web apps and CMS are supported (can still run well with the PHP environment). As per PHP 7, there are still not enough information of how many CMS / scripts except WordPressand OwnCloud those are already PHP 7 compatible. So if you are planning to build a WordPress site with VestaCP, you can try this tutorial and feel the awesomeness of PHP 7. But I must also remind you that since VestaCP doesn’t include PHP 7 by default yet, so I recommend you to not using VestaCP + PHP 7 on production websites unless you are a sysadmin Ninja. However, with default Vesta setup (Nginx as proxy + Apache + PHP), this method still can work properly so it is safe if you’ll just want to host personal blog or few blogs inside one server. 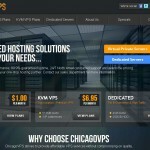 Step 1 – Install VestaCP on your vps, cloud or dedicated server. 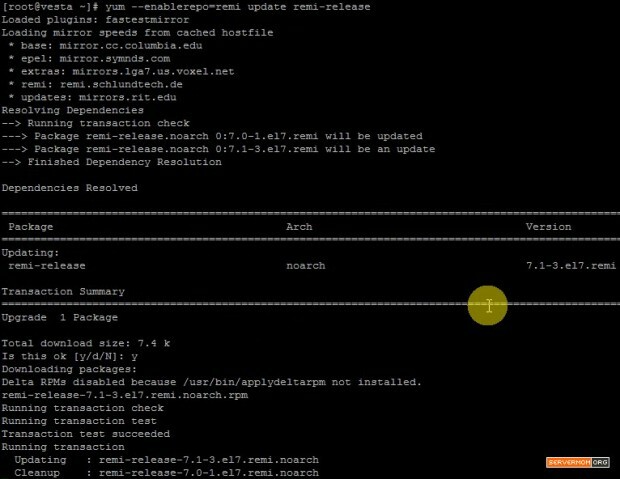 Despite this tutorial done on CentOS 7, but the steps are pretty much similar. 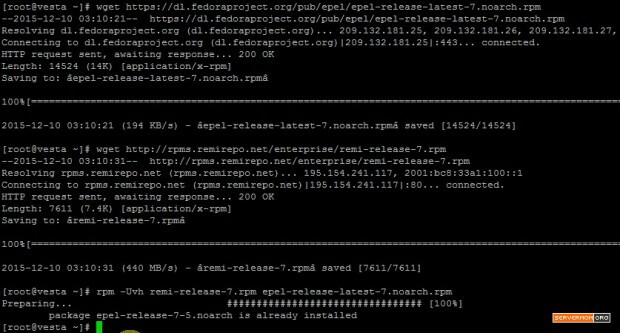 Step 3 – Now we need to install remi repo or at least make it updated. PHP 7 is considered new and is not available via Yum at base CentOS repo. Simply answer Y when asked. See? It is running PHP 7.0 now. How cool is that! You can watch all steps above in my video to make sure you understand and be confident in following the steps. 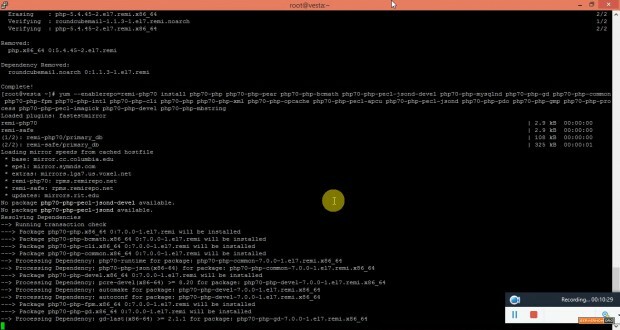 How to upgrade PHP to PHP 70 latest stable build. I installed Vestacp + PHP 7.0 in a sub directory, installed WordPress (v4.4) using Twenty Sixteen theme, and uploaded a full of dummy content on it (dummy content credits to WPTest.io). I used Digital Ocean droplet with 1GB of RAM + 1 processor core running CentOS 7.1 x64. The test done using free account of several server speed test services including Loader.io, Blitz.io and LoadImpact.com. Result: The server can operate and serve request normally at that level of test while average response time is 1299 ms with 363 ms minimal and 2402 ms max. Result: The server still did not crash but it started delivering 500 error code (Internal Server Error). Average response time is 1407 ms with 11 ms min and 4565 max.